NOKIA RETHINKS ITS DIGITAL HEALTH STRATEGY:Nokia is planning a strategic review of its Digital Health business – a part of Nokia Technologies – just months after touting its confidence in the segment’s future. 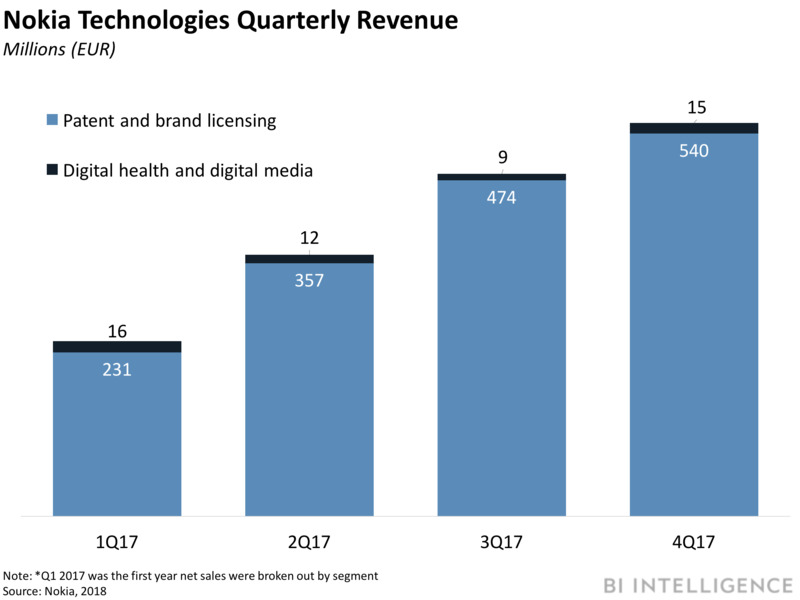 Digital Health includes Nokia’s slew of wearable products, such as its Steel HR smartwatch, its connected thermometers and scales, and its Health Mate mobile app. The review comes after Nokia announced its Q4 2017 earnings. Although Nokia Technologies saw substantial growth up 79% year-over-year (YoY), it also put a spotlight on Digital Health’s role in dragging down the overall revenue expectations of the Nokia Technologies business, according to the Q4 earnings report. Nokia initially looked to Digital Health to renew the revenue growth of its Nokia Technologies business, beginning with the purchase of French wearables company Withings in late 2016. However, the segment failed to develop as Nokia had hoped and resulted in the company having to write-down 141 million euros ($US164 million at the time) in Q3 2017, something that continues to impact the company’s top line, according to its Q4 2017 earnings report. Nokia’s struggle to leverage its brand name and industry experience to break into the digital health market could serve as a lesson for other tech firms looking to enter healthcare. Nokia attempted to take on the highly competitive and increasingly crowded wearables market, however, by the time it launched its new smartwatch, demand for wearables had largely cooled, and Apple had captured most of the premium market. One route Nokia could take is to focus on licensing and services within healthcare, such as it did with mobile technology after it missed the rise of the smartphone market. 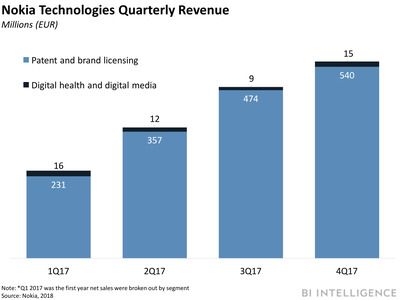 It would also be in line with the “more focused and more agile,” digital health business the company outlined in its Q4 report. INTELLIGENT CLINICAL DECISION SUPPORT PLATFORM GETS FDA APPROVAL: Viz.ai, the applied artificial intelligence (AI) healthcare company, received permission from the US Food and Drug Administration (FDA) to market its clinical decision support (CDS) tool designed to identify large vessel occlusion (LVO) strokes and alert specialists. The tool connects to a hospital CT scanner and uses deep learning technology – a part of machine learning – to read CT scans and determine if a patient has experienced a stroke. If it identifies LVO symptoms, the platform can alert the hospital’s stroke specialist, and send radiological images to their mobile device. This could mean that stroke victims get vital care from specialists at a faster rate – in over 95% of cases in a 300-patient performance study, the automatic notifications to specialists were faster than standard protocol, saving 52 minutes on average. Timing is of the essence when an individual is experiencing a stroke – two million brain cells are lost every minute during a stroke, which leads to nearly 800,000 deaths each year in the US. NEW ATA CEO WILL FOCUS ON GROWTH AND AWARENESS OF TELEMEDICINE: The new CEO of the American Telemedicine Association (ATA), Ann Mond Johnson, will focus on strategic partnerships and alliances to expand the reach and awareness of telemedicine services in the US, according to mHealthWatch. Johnson will assume the role beginning March 5, 2018. Telemedicine is the segment of the telehealth market that involves direct clinical care via mobile technology, such as a virtual doctor visit. And while most healthcare organisations in the US either already offer telehealth solutions, or are planning on implementing them this year, adoption and usage of the services have been struggling to pick up steam. This is being caused in part by a lack of consumer awareness of telehealth offerings and solutions, but also a lack of promotion by healthcare providers. Forty-four per cent of consumers said they would be more likely to try telemedicine if their physician recommended it, according to Accenture. That’s compared to 31% who said the same thing about their health insurer. The ATA is hoping that Johnson’s experience in the healthcare industry will help the organisation build and develop the strategic relationships with all aspects of healthcare to facilitate growth and adoption of telehealth technology. PENN MEDICINE LAUNCHES EXTENSIVE TELEHEALTH HUB: Penn Medicine, the academic medical center for the University of Pennsylvania, has launched the Center for Connected Care, one of the largest telehealth hubs in the US. The center is offering a range of 24/7 virtual urgent care services, including remote homecare services for the chronically ill, a telemedicine service for critically injured pregnant women, and access to the medical center’s electronic intensive care unit (e-ICU). Penn Medicine will also provide telemedical specialty services in a number of different fields, including dermatology, ophthalmology, radiology, sleep medicine, and neurological conditions to patients at a regional, national, and international level. Penn Medicine likely hopes that the launch of this new hub will help it become a leader in the telehealth space, as interest in the field continues to blossom. Responding to a survey by Sage Growth Partners, 56% of healthcare executives stated they had implemented telemedicine services, and of the 44% that had not done so 86% said it was a medium to high priority, according to FierceHealthcare. Roche, the global pharmaceuticals company, announced Thursday that it will acquire Flatiron Health, an oncology-specific electronic health records software company, for almost $US2 billion. Roche hopes Flatiron Health’s platform and extensive research portfolio will help to expedite the development and delivery of cancer medications. Healthcare spending in the US is projected to grow 5.3% in 2018 and reach 20% of GDP by 2026, reflecting the rising costs of medical goods and services and higher Medicaid costs, according to the CMS Office of the Actuary. That’s up from 18% of GDP reported in 2016. The growth rate – 1% higher than GDP growth rate over the same period – could incentivise the US government to speed up regulations and prioritise incentive packages for healthcare systems to implement digital health services, many of which could help reduce healthcare spending. Researchers at King’s College London Institute of Psychiatry, Psychology, and Neuroscience have demonstrated how a video game paired an MRI scanner could help people with schizophrenia control verbal hallucinations, MobiHealthNews reports.